B&H Photo's latest discount brings the 2018 model to the starting price of the old model. If you’re in the market for a new MacBook Air, you’ll be happy to know that B&H Photo is currently selling the entry-level 128GB modelRemove non-product link for a mere $999, down from the normal retail price of $1,199. That means you’ll be getting it for the retail price of the old MacBook Air (although discounts for that model are becoming increasingly common). Act quickly, though, as the deal ends on December 29 at 11:59 p.m. Eastern. Fortunately, B&H’s "Deal Zone" savings extend beyond this 128GB model. You can also take $200 off the 256GB modelRemove non-product link, which brings the price $1,199 (down from $1,399). You can also take $100 off the 512GB modelRemove non-product link, which brings the price to $1,499 (down from $1,599). For that matter, B&H is selling the 128GB model with 16GB of RAMRemove non-product link with a $100 discount, which brings the price to $1,299 (down from $1,399). Honestly, though, this feels a little overkill. If you have 16GB of RAM, it’s fairly safe to assume that you want to perform intensive tasks like playing games or editing video, and frankly, that’s barely possible with a mere 128GB of RAM. I even hesitate to recommend the 128GB model with the 8GB configuration unless you solely plan on using your MacBook Air for writing or internet research as it’s increasingly difficult to do anything with a laptop with that kind of storage space. That said, I do admire the new MacBook Air. Sure, the keyboard changed and the body lacks the wealth of ports on the previous model, but I enjoy using the bright Retina display and the convenience of the new Touch ID integration. For that matter, the "butterfly" keyboard on this model sports the membrane Apple introduced with the 2018 15-inch MacBook Pro, which keeps particles from falling underneath the keys and results in a quieter typing experience. When combined with the slightly inclined keyboard—which I always miss when I use the table-flat MacBook Pros—I find it’s actually quite wonderful for writing. 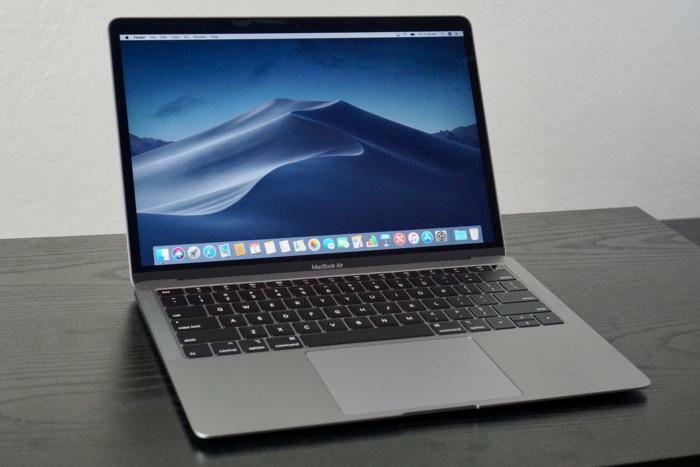 "If you’re familiar with the 12-inch MacBook, using the new MacBook Air makes it immediately obvious that this is a slightly updated and scaled-up version of that model, with the “Air” name attached. If you’ve been waiting for years for Apple to finally re-imagine the MacBook Air in a way that will once again revolutionize the thin-and-light laptop market, you’re going to be disappointed to find that it has only been brought up to the standards of other modern Mac laptops, with all the good and bad that goes with that."